And the other was railroad gin. The guiding metaphor in Peter Coyote’s new spiritual biography is drawn from a line in an early Bob Dylan song. For Coyote, the twin forces Dylan identifies as Texas Medicine and Railroad Gin  represent the competing forces of the transcendental, inclusive, and ecstatic world of love with the competitive, status-seeking world of wealth and power. The Rainman’s Third Cure is the tale of a young man caught between these apparently antipodal options and the journey that leads him from the privileged halls of power to Greenwich Village jazz bars, to jail, to the White House, lessons from a man who literally held the power of life and death over others, to government service and international success on stage and screen. Expanding his frame beyond the wild ride through the 1960’s counterculture that occupied so much of his lauded debut memoir, Sleeping Where I Fall, Coyote provides readers intimate portraits of mentors that shaped hima violent, intimidating father, a be-bop Bass player who teaches him that life can be improvised, a Mafia consiglieri, who demonstrates to him that men can be bought and manipulated, an ex game-warden who initates him into the laws of nature, a gay dancer in Martha Graham’s company who introduces him to Mexico and marijuanas, beat poet Gary Snyder, who introduces him to Zen practice, and finally famed fashion designer Nino Cerruti who made the high-stakes world of haute monde Europe available to him. What begins as a peripatetic flirtation with Zen deepens into a life-long avocation, ordination as a priest, and finally the road to Transmission---acknowledgement from his teacher that he is ready to be an independent teacher. Through Zen, Coyote discovers a third option that offers an alternative to both the worlds of Love and Power’s correlatives of status seeking and material wealth. Zen was his portal, but what he discovers on the inside is actually available to all humans. 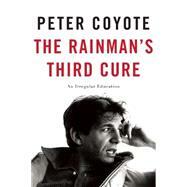 In this energetic, reflective and intelligent memoir, The Rainman’s Third Cure is the way out of the box. The way that works. An ordained practitioner of Zen Buddhism and a politically engaged actor, Peter Coyote began his work in street theater and political organizing in San Francisco. In addition to acting in over 140 films, and working with directors such as Martin Ritt, Steven Spielberg and Roman Polanski, Coyote has won an Emmy for narrating the award-winning documentary Pacific Century.” He has also narrated The West,  The Dust Bowl,” Prohibition,” and The Roosevelts” for Ken Burns. In 1993 he was awarded a Pushcart Prize for Carla’s Story,” published in Zyzzyva. He lives in Mill Valley, California.